Experimenting with strikingly new dimensions of color and texture — and equally at home with the music of Brazil, Bartok, and Monk — here is the remarkable TrioConcertant in its long-awaited debut recording. This CD pushes insistently against the categorical barrier between classical, jazz, and popular music. 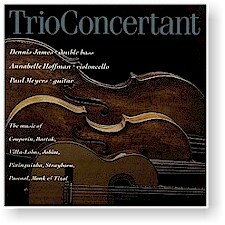 An instrumentation for which there is no pre-existing literature becomes simply a welcomed challenge to Dennis James, Paul Meyers, and Annabelle Hoffman — three gifted and versatile musicians who have set these classics in an unforgettably new light with arrangements and performances that are truly brilliant. Recorded in January 1990 at Van Gelder Studios in Englewood Cliffs, New Jersey.